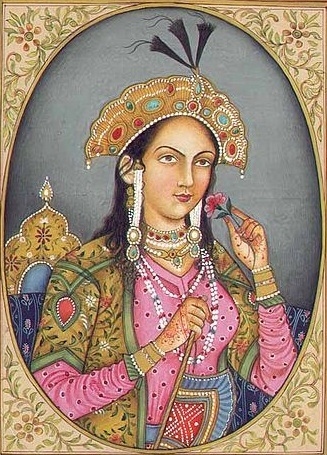 Empress Nur Jahan married Mughal Emperor Jahangir in 1611 and rose to prominence, becoming the first female co-sovereign in Mughal history. Ruby Lal an accalaimed historian of Mughal history has written an amazing book “Empress, the Astonishing Reign of Nur Jahan” that I recently read and loved finding about the inspiring life of a queen who we sadly don’t know much about. Jahangir’s other son Sheheryar. Because of this Shah Jahan made sure that all records of Nur Jahan’s rule were eliminated from history. Ruby Lal has however done extensive research and unearthed fascinating facts and stories from Nur Jahan’s life. Many confuse her as prince Saleem’s Anarkali and with the famous pigeon incident. It was a fact though that Nur Jahan had been married before and was a widow when she married Jahangir. Some say that Jahangir fell in love with her when she was already engaged but Emperor Akbar did not agree to the match and Nur Jahan was hurriedly married off. Jahangir never forgot about her and made sure they were joined soon after he assumed power. Ruby Lal shares evidence in her book that Empress Nur Jahan rose in power due to her own abilities. Jahangir was happy to share sovereignty with his queen as she held court, issued coins in her name and gave imperial orders. She was also a talented huntress, patron of the arts and an architect. It’s said that the Taj Mahal is designed after the tomb Empress Nur Jahan built for her parents, that’s also in Agra and called the “mini Taj”. One of my big regrets is that I wasn’t able to visit Nur Jahan’s tomb that’s in Shahdara Lahore. Even on my last visit, we were stuck on Ravi bridge and the sun set right in front of us and we missed the time slot to view Jahangir and Nur Jahan’s tombs, both of which Nur Jahan designed. Do read Ruby Lal’s book “Empress, the Astonishing Reign of Nur Jahan” to get inspired by a graceful, brave and talented Empress from South Asian history. Interesting to hear about this book, should find a copy to read myself. The sight at Ravi river sounds beautiful. Also had never known about the mini Taj! Even though we had heard that Shah Jahan had wanted one more built for himself. v interesting. I’ll definitely find time to get it by Amazon. thnx for the share. You will love it! I have shared the amazon links to buy the book in the post! Thanks, will pick from my library today. You will love it! Do share your thoughts after you read it!